After a two-hour motorbike ride along a goat track that wound up mountains and down into valleys, we arrive in Sam Tai, a Yindu village outside of Kanpetlet. We stop by the chief’s house for a cup of coffee and to introduce ourselves and the Tattoos of Asia project. We then move over to Shen Har’s house, where she resides with her family. We are welcomed at the door and her grandchildren come to watch us work. We start our interview the way we always do, enquiring about her life and experiences with her tattoo. Her face lights up as we ask her about her personal story. She tells us that for her, the tattoo was something she felt she must do. It was her culture and although it was painful, she wanted to get it done. She recalls collecting the thorns to make her tattoo by herself just before the rains came. This puts the timeline in the middle of summer, in stark contrast to many of the other peoples we have spoken to. Shen Har says she feels a pit in her stomach every time she realises that the tattoo culture will be gone with her and her peers. As we’re preparing to leave, she asks us how we came to her village. We tell her that we rode here on bikes. She goes quiet for a moment and then tells us that she wishes her husband could be here. 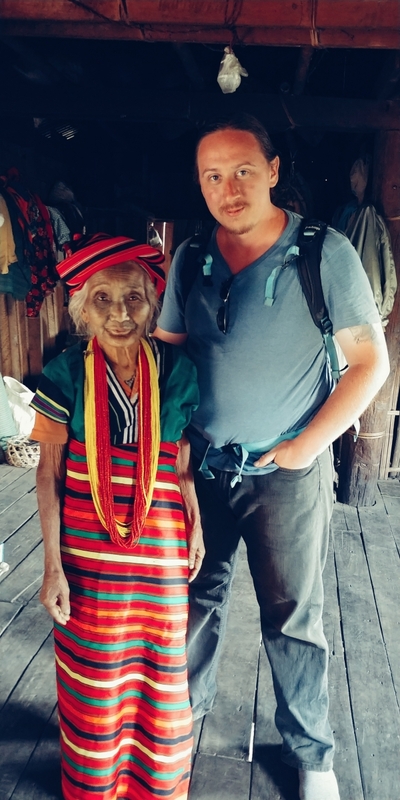 We are the first foreigners she has ever met, but her husband passed before the road was made and he never even got to see a motorbike.